Note: All uses of any images found on this website, other than directly naming this website, is completely unauthorized. This means any usage of these images, are included, but not be limited to; downloading, copying, distributing, and/or reproducing in any manner is prohibited without the prior express, written consent of Crystal Hairs ton- The owner of Joidiamonds.com . For rights and permissions please contact me directly. You should assume that everything you see or read on the site is copyrighted unless otherwise noted and may not be used otherwise stated in these Terms and Conditions without prior written permission of Crystal Hairston. Any unauthorized use of the images on this Site may violate copyright laws, trademark laws, the laws of privacy and publicity, or communications regulations and statutes. Unless specifically stated, I/Joidiamonds.com reserve the rights to display/link/write about your projects within my website/or platform as part of my portfolio. by CLIENT, the DESIGNER will assign the reproduction rights of the design for the use(s) as described in the proposal. According to the Copyright Law of 1976, the rights to all design and artwork, including but not limited to photography and or illustration created by independent photographers or illustrators retained by DESIGNER, or purchased from a stock agency on your behalf, remain with the individual designer, artist, photographer or illustrator. Unless a purchase of “All Rights” (A Buyout) is negotiated with DESIGNER and/or his/her authorized representative, you may not use or reproduce the design or the images therein for a purpose other than the one(s) originally stipulated. before proceeding. If printing or other implementation is done through your vendors, you agree to return to us all our original mechanicals and artwork (slides, prints, drawings, separations, etc.) within two weeks, and to provide us with printed samples of each project. I agree to store files and all related material for a project for a period of 6 months beyond the delivery of a job. Therefore, I reserve the right to discard them. 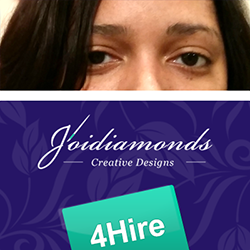 Copyright © Joidiamonds.com All Rights Reserved.